Sian Martin does the Certificate and Diploma for Embroidery. Many of the members of the above Yahoo group were studying with Sian and were enthusiastic about her teaching. Linda Kemshall teaches Patchwork and Quilting, Creative Sketchbooks and Creative Computing. She has a Student Gallery so you can have a look at the work her students are producing. She allows you to pay for just the first module in order to find out if her course is for you, before paying for the rest. You can also pay module by module (there are ten altogether). Opus Online has a vast array of courses including Embroidery, Patchwork and Quilting and also a Degree in Embroidered Textiles. I don’t know much about them; they have a gallery too, but it isn’t as comprehensive as Linda Kemshall’s. 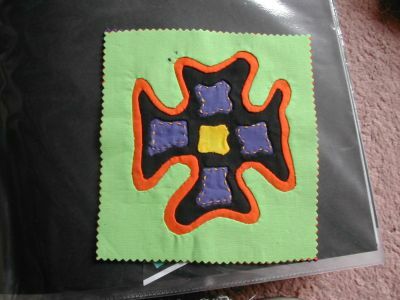 The School of Stitched Textiles teaches Embroidery, Stumpwork and Patchwork and Quilting. They also have a number of gallery pages showing students’ work. They offer payment by instalments too. These are the only ones I can find at the moment, although I think there is one based in Swansea too. If you know of any more or have any experience of the above, do email me or leave a comment! 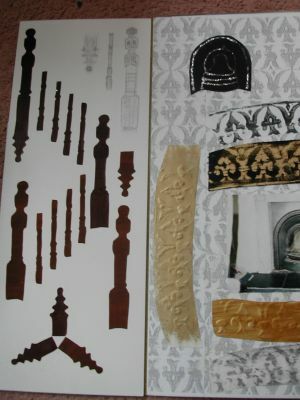 To finish this house design board series of posts, on the left here is a couple of patterns I made from my newell posts and bannisters. Not very exciting, but I included it for the sake of completeness. 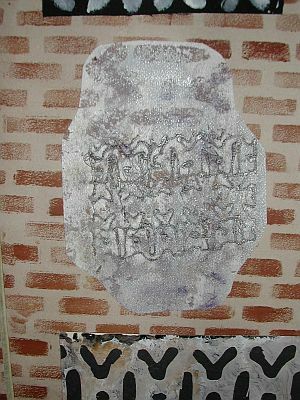 This is a sample of mola quilting which I did using the design motif developed in the last photo. In the City and Guilds course we had to do samples of all sorts of patchwork and quilting techniques. This one isn’t very clear, but I scanned the print into my computer and digitized it using Customizer 2000 and scanned it on to a memory card for my machine. I then distressed it by ironing a painted nappy liner over it. (I was obviously playing a lot with nappy liners and my new sewing machine at this time… haven’t done much with either since – at least with the computerized part of the latter).